Poker does not just mean Texas Hold’em, there are more games than that online. These games, and variations thereof, are available at all the big and popular poker rooms. You will always find a game at these bigger rooms and chances are that you will find a game that suites your budget and skill level too. New poker rooms are not bad but you do initially struggle to find a game. Our recommended poker rooms are all well established. Playing poker online is not all that different to playing in a land based casino other than being able to play from the comfort of your own home. You are of course also NOT on show and the skill of hiding your excitement when you have a great hand is not tested. This can be a very big plus if you are one of those people who cannot hide a smile. This is by far the most popular game out there. It is the core game of the World Poker Series and can regularly be seen on television. The object of the game is to finish with the best poker hand, and win the pot. Two cards are dealt to each Player (these are called pocket cards), and then 5 community cards are dealt by the dealer. The player needs to make the best hand available out of the total 7 available cards. A round of betting precedes each community card. Seven Card Stud Poker has five rounds of betting. 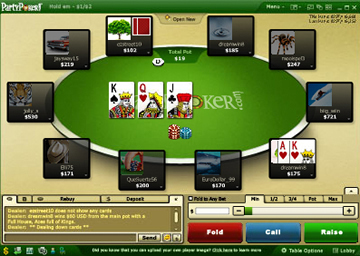 Each player is dealt three cards, two pocket cards and one visible card. Rounds of betting precede the Dealer giving each player three more up cards and one more down card. A final round of betting occurs after the last card, and the Player with the highest five card hand wins using any five of their seven cards. Each Player is dealt two cards, one pocket card and one visible card. In the second round, another visible card is dealt to all Players at the table. A round of betting follows. This process continues until each player has one pocket card and four visible cards. Caribbean Stud poker is also a 5-card poker game played with a single deck of 52 cards, where you play against the Dealer. This exciting game also features a progressive jackpot. Video Poker takes this theme to another level. Variations of scoring come to the fore where rules covering everything from Wild Aces to Joker cards are on display. These variations are such a popular genre of games that we have a totally separate section covering video poker games. The strongest poker hand is the Royal Flush. Aces high straight flush. This is followed by the Straight Flush. Same suite, sequential, but not Aces high. Full House which is Three of a Kind plus a Pair. Flush which is 5 cards of the suite, not sequential. Straight which is 5 sequential cards that are not of the same suite. Party Poker Dollar for Dollar match up to $500 on your 1st deposit. Poker Stars $20 Match and entry into a $100 000 Freeroll. 888 Poker $88 Free and 3 tickets to the Super XL Series. Winner Poker 250% Bonus of up to R18000 for new players.